Cool Cat Casino is a first-class casino and one of the top providers of online gambling entertainment. Operating since 2004, they have rapidly become the first online destination for those who look for a safe, secure and unforgettable gaming experience. Powered by RTG, one of the best software providers who offer impressive graphics, fast games and a solid variety of overall games, Coolcat provides not only first-class entertainment but access to an extraordinary gaming experience. One of the aspects of Cool Cat’s casino acceptance among players is the fact that player’s security is taken very seriously. Their customer’s personal and private data is managed with strict security measures, guaranteeing that it won’t be stolen. Banking operations are encrypted on secure servers using Secure Socket Layers or SSL, making it practically impossible to intersect or steal your sensitive banking information. With over 190 online casino games to choose from, Coolcat Casino is, without doubt, a great option if you are looking for real fun and first quality entertainment. From over 90 slot machines to 7 Blackjack variations, Video Poker machines, and the always popular classic casino games like Roulette, Baccarat Craps, and much more; Coolcat offers you a unique gaming experience! Cool Cat has gained a reputation for having some really impressive bonuses. Lots of casinos have signup bonuses. CoolCat is famous for their regular, ongoing bonuses and features a slew of exciting bonuses on a daily, weekly and monthly basis. New players can take advantage of an impressive 1000% signup bonus and a $100 free chip. Regular players are treated to monthly promotions, too. As of publication, CoolCat Casino was offering players the chance to win a $10,000 free chip and the site also offers VIP bonuses to its most valued players. An abundance of coupons entitles players to countless offers and benefits to allow players at every level to get what they strive for. CoolCat has an amazing VIP Program that includes five impressive levels where top players can earn $1,000 welcome chips, 50% monthly insurance, fast-tracked payouts, and personalized promotions. And even the entry level VIPs earn rewards that are better than what the competition offers. CoolCat Casino is different. Yes, they use the same software as some of the biggest online casinos on the market. They’re powered by RTG, one of the most respected online casino games makers in the world with outstanding graphics and unique games. But they don’t just license their software and call it a day. They seem to really work with RTG to enhance and customize their online casino experience. You can tell a site you can’t trust from the looks of their homepage. If they don’t list a toll-free number for getting in touch, you should stay away. 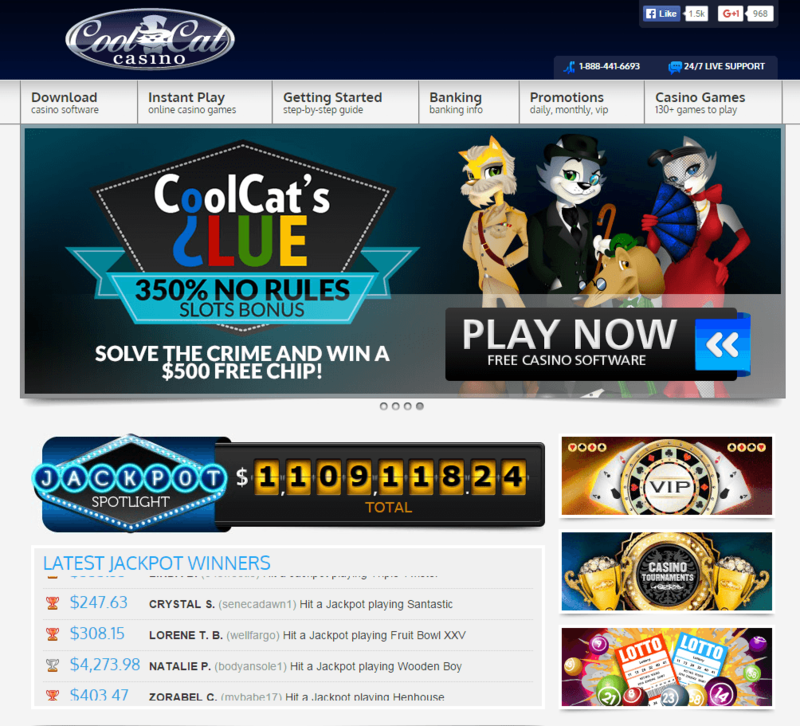 CoolCat Casino plasters their contact information on their homepage. In fact, no matter what page you visit on the CoolCat website, the header (which features a live chat link and a toll-free number) remains the same. We tested both methods of customer service and we’re pleased to report that the customer service reps are friendly, knowledgeable, and English speaking. And support is available 24 hours a day, 7 days a week, which is a huge plus for international players. You can contact them via Live chat, phone or email. Coolcat offers many deposit options for its players such as Credit Cards (Visa/Master Card), Neteller, Click2pay, Moneybookers and person to person money transfers. Payment methods are numerous. They are processed via Pay2Card, Wire transfers, Neteller, Moneybookers, Cashier Checks, and person to person to person money transfers. CoolCat Casino can easily be summed up in one word—cool. Cool promotions. Top of the notch Customer Service and some of the coolest games online. Coolcat offers a great gambling experience for every one boasting one of the highest win percentages in the online gambling industry. So whether you are new to the world of online Casinos gambling or have been playing for years Cool Cat is the Casino for you!